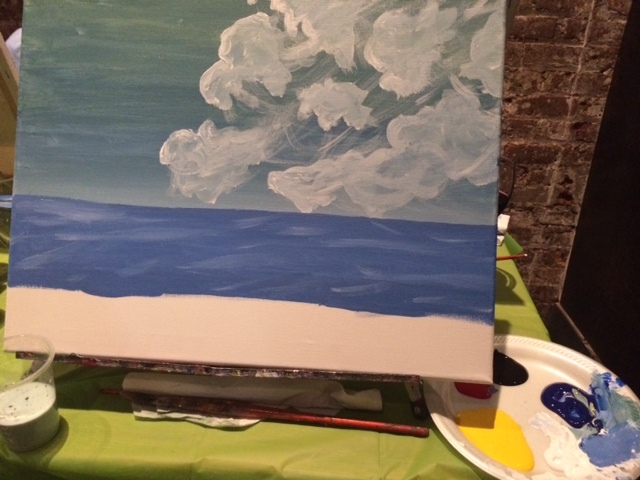 I just got back from Paint Nite at Revel, a restaurant/bar/lounge located in the Meatpacking district. 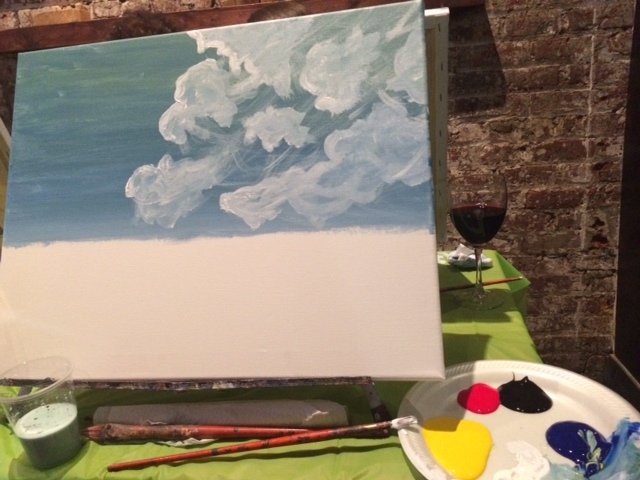 I was brought along to an evening of client schmoozing where we wined, dined, and painted with one of our website’s largest advertisers. 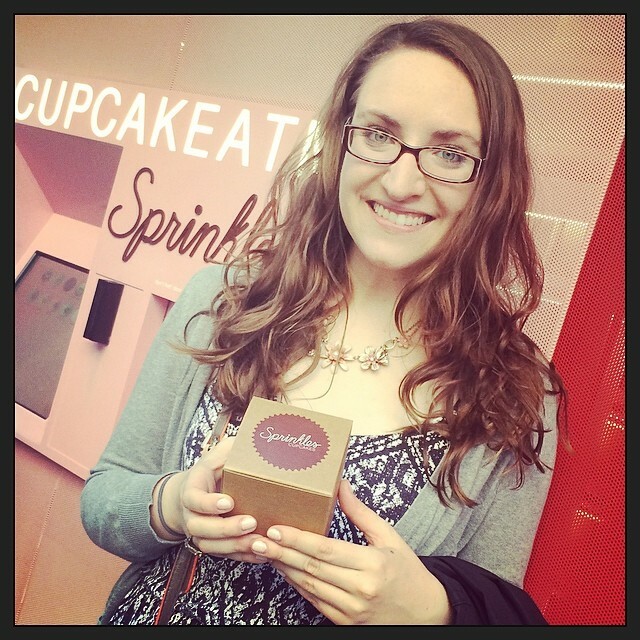 This was my first work event at the new job! I’m not going to tell you how much the evening cost, but it was waaay into the triple digits. It was a lot of fun, but I’m still experiencing sticker shock from the price tag. Thankfully, I wasn’t footing the bill. Okay, back to the adventure! The evening started with glasses of pinot grigio and delicious Italian cuisine. I got the house made gnocchi with tomato sauce and parmesan cheese. Delizioso! The restaurant was lovely and even though we were inside it felt like we were dining in an Italian garden filled with greenery and white lights. After dinner we moved to a back room and took a seat at our blank canvases, ready to create some art. Voilà! A masterpiece! The starting price for this original Kimberly D. Horner is the reasonable price of 2 million. Let the bidding begin! While our paintings dried, we sampled a few different desserts. My favorite was the tiramisu — it was light and delicious. Then we called it a night. Overall it was a very fun, albeit extravagant night. 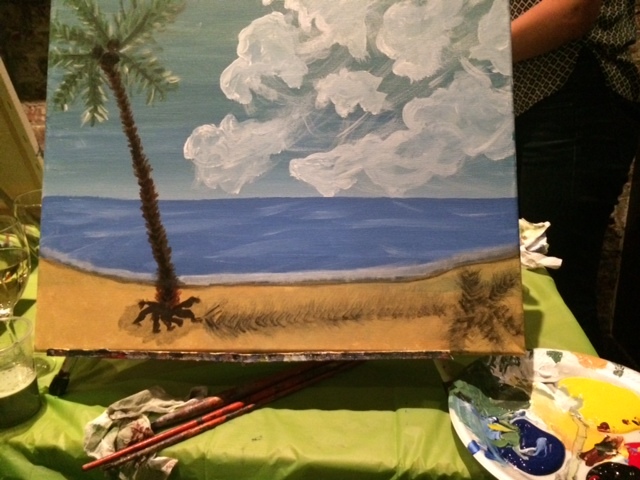 If you are looking for an activity to get your creative juices flowing (and aren’t afraid to shell out a lot of cash) I’d definitely recommend giving Paint Nite a try. Hi there! I'm Kim. Thanks for reading! Enter your email address to receive some inbox love whenever there is a new adventure to enjoy. Our family 💕🐶 Thank you @zaftiggy for the beautiful wedding gift 💖 Best sister-in-law ever!